The Whitman-Hanson Regional High football team returns eight starters on both sides of the ball and boasts a senior class of 19 as it prepares for a pivotal season. Seven days after the 2017 campaign concluded, upperclassmen on the Whitman-Hanson Regional High football team began rallying their teammates to get into the weight room. Preparations for this fall were already underway. The Panthers were coming off their third straight 7-4 campaign, which included a first-round playoff exit. But unlike the previous two, it was capped by a disappointing 23-12 loss to their longtime Turkey Day rivals, which left a sour taste in their mouths heading into the offseason. The winter, spring and summer months were certainly long, and consisted of visits from many high-profile colleges, workouts with Marines and strength and conditioning with a current Springfield College linebacker. While eighth-year head coach Mike Driscoll acknowledged dropping that last game motivated his players in the offseason, thus making them better, it’s time to turn the page. It’s not much of a new team personnel-wise as the Panthers are down just four starters from a season ago. In terms of experience, it’s like night and day compared to last fall for Driscoll, who returns eight starters on both sides of the ball. The slew of returnees, many of whom have been starting since they were a sophomore, have the Panthers, who finished 3-2 in the Patriot League last fall, garnering a lot of attention from around the state. However, it’s just like any new season to Driscoll. Not only does W-H return an experienced group of starters, but it will carry a senior class of 19, which puts even more of an emphasis on winning. While Connors is a key senior captain, he’s more pivotal at middle linebacker, where he led the team with 104 tackles last season. 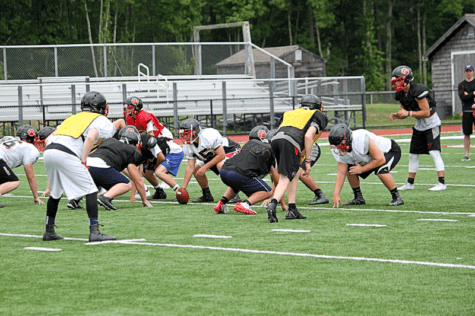 Sweeney also holds down a post at tackle on offense, where he is tasked with creating time and paving holes for dual-threat quarterback and senior captain Ethan Phelps. Phelps, who also assumed his starting role in 10th grade, garnered over 2,600 total yards and 32 touchdowns in 2017. Driscoll said he believes Phelps can be even better. To Phelps’ advantage, he won’t have to worry about developing a rapport with his main playmakers because the Panthers return nearly all of them. Out of the backfield, Connors (80 carries for 484 yards, 3 TDs in ’17) and classmate Brendan Frawley (78 carries for 447 yards, 2 TDs) enter their third year together. “Frawley is more of speed and [a] slasher and Mike’s more going to run you over and get tough yards,” Driscoll explained. The W-H head coach added he wants to get senior Billy Martell, who rushed the ball just once last season, some more touches. At wide receiver, Phelps welcomes back six of his seven top targets. As a unit, the returnees — led by Martell (12 receptions for 153 yards, 2 TDs) and senior captains Jacob Nixon (23 receptions for 211 yards, 3 TDs) and Rian Schwede (19 receptions for 300 yards, 2 TDs) — hauled in 74 percent of Phelps’ competitions and accounted for 73 percent of his yards in the air last fall. At kicker, Jake O’Brien (18 of 19 on PATs and 3 of 3 on FGs) is back for his third year as the starter. “In my opinion, he’s one of the top five kickers in the state,” Driscoll said. Key losses for W-H from last season are center and defensive lineman Riley Holland, wide receiver and cornerback Brett Holmes, linebacker Jack Kelly and offensive tackle Hunter Dunn. “They were a great working group kids who set a huge tone for our team,” Driscoll said. As for what is going to propel the Panthers past a 7-4 record this season, it’s tough to overlook their athleticism and experience. The Panthers open their 2018 campaign at home Sept. 7 against non-league foe Marshfield at 7 p.m.